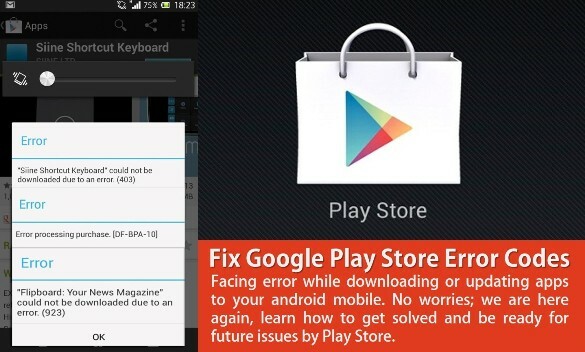 Have these some of the most common Google Play store errors ever faced by you? Anyhow, we've all seen these Google Play Store problems in many times. You might experience an error that contains random numbers when you download or update android apps from the Google Play store. Here you're going to learn, how to fix google play services has stopped, Google play store server error, No Connection - Retry error message, Google Play Store Error 963, Error 491, Error 18, Error 495, Error 103, play store not downloading apps, 'insufficient storage available' error message, or error retrieving information from the server, error downloading, authentication error, insufficient storage error, check your connection and try again error, Google play store has stopped. Learn how to fix common Google play store app error codes 491, 413, 495, 941, 921, 924, 923, 926, 961, 963, 971, 504, -506, 693, 919, DF-BPA_09, Df-Dferh-01 & Error -24. Google play store is nothing but the online market website to download and installs various apps for user requirements. After upgrading to Nougat you can't download apps from play store and also all other Google related services are not connecting to the WiFi home network. Most of the times, it shows download pending in play store while downloading or updating the app. Whereas, the next problem is that Google play services won't update as it is "not compatible with the version" even by resetting all Google apps to their factor default version as a fix. For the Google play mobile application download is easy but these Google play service app download errors like play store stopped working, are generally caused with many of us in several times, that when you are going to try to download or update the application on the Android devices. The result is only a cryptic error message having some random numbers from the Google play store. It's not only disturbing you but make the panic situation. Here's the list of most common playstore errors and their solutions you can follow when the Google play store app doesn't work for you. In the previous page, I was talking about; Smartphone Buying Guide: 15 Things To Consider Before Buying A New Phone and today, I want to provide you a very quick solutions to fix common android errors you may see while using mobile phone. Android customers use Google play store app to download, install and update several Apps on their devices. No doubt Google play store is the greatest and trustworthy source that users choose to download their desired apps but many a time user faces some Errors in google play store. The Google Play Store doesn’t always work nicely with users. It experiences a large number of possible issues - called error codes. Some error are easy to understand but some are hard to get solved. Last time we have seen, On Screen Display Flickering Error by Android [SOLVED] and [Fixed] Unknown Error Code During Application Install: "-24" - Android App Installation Problem. Check out; [FIXED] "Android.Process.Acore Has Stopped"
Also read; [FIXED] "Unfortunately, The process com.google.process.gapps has stopped"
Check out; [FIXED] "Error Downloading...Insufficient Space on the Device"
You may feel this issue won't get resolved, however, after the new release of the Play Store App, it will definitely solve the problem. Check out; [FIXED] "There Was A Problem Parsing The Package"
Usually, this issue occurs when you reset your Google account which you are using for Playstore. Also in case, you did Factory Reset of your phone. Or sometimes you registered a new Google Account for app's downloading/ installation. Problem shows that - In these Application download and updates are impossible. You are not able to download or update apps from play store and if it throws an error. Don't worry, you may find below solutions which help you resolve this issue. This occurs when you can't download or update the app. Sometimes application can't be downloaded. Do the same thing for all below mentioned. Apps >> All >> Download manager. This problem usually throws while retrieving information from Google Playstore server. Sometimes by waiting for couple of hours, the problem gets sorted itself. If it doesn't, you can refer below solution to take care of this issue. It's a generic Playstore error.